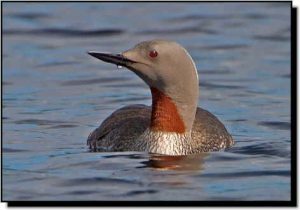 Comments: The smallest of the loon species, Red-throated Loons are distinguishable from other breeding loons by their grey necks with a red throat-patch and dark backs. During the nonbreeding season, the white on their face extends above the eye and almost completely around the neck. Their backs have white speckling. Immatures have a spotted appearance to their backs, never a barred pattern. Their bills appear upturned, they tend to hold their heads tilted upwards, and during flight their necks appear drooped. Unlike other loons found in the region, Red-throated Loons show white along their flanks when swimming. Red-throated Loons are, with increasing frequency, sometimes found on large reservoirs throughout the central Great Plains during winter and migration.